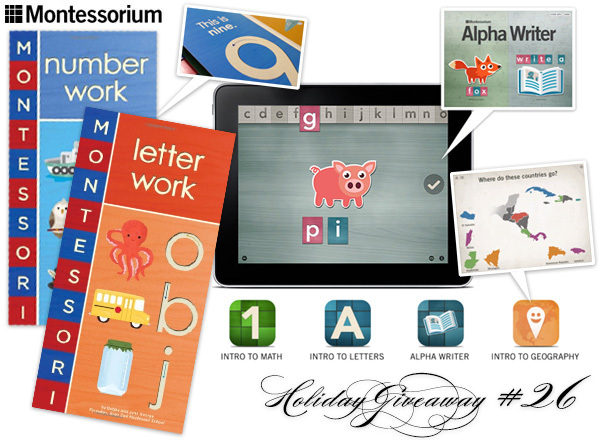 Today is definitely baby/kids day of giveaways ~ NOTCOT Holiday Giveaway #26 is from Montessorium! They have quite a generous bundle of giveaways and various ways to win! 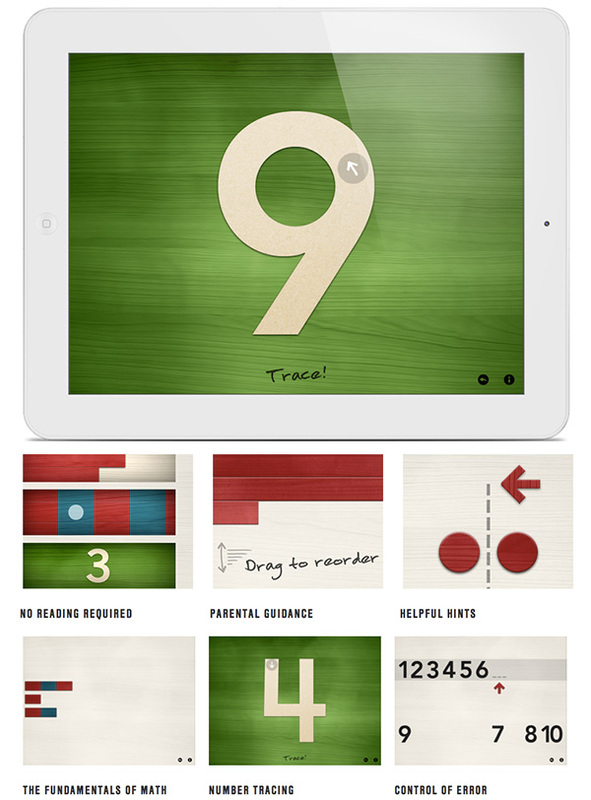 Through commenting, you have 10 chances to win Letter Work and Number Work Books and all four Montessorium apps: Intro to Math, Intro to Letters, Intro to Geography, Alpha Writer. For those who tweet or instagram, there are 10 chances to win the full app bundle too! Justine and I grew up Montessori kids - and we’ve never forgotten the awesome minimalist design that is present through all of the montessori objects - from sand paper letters and numbers, to the counting beads, blue solids… and so much lacquered woody goodness. Perhaps those early designs helped influence our design aesthetic here at NOTCOT at an early age… But when we were learning with all of that, there were no ipads… we were barely playing with computers… and it’s a whole new world of options now! 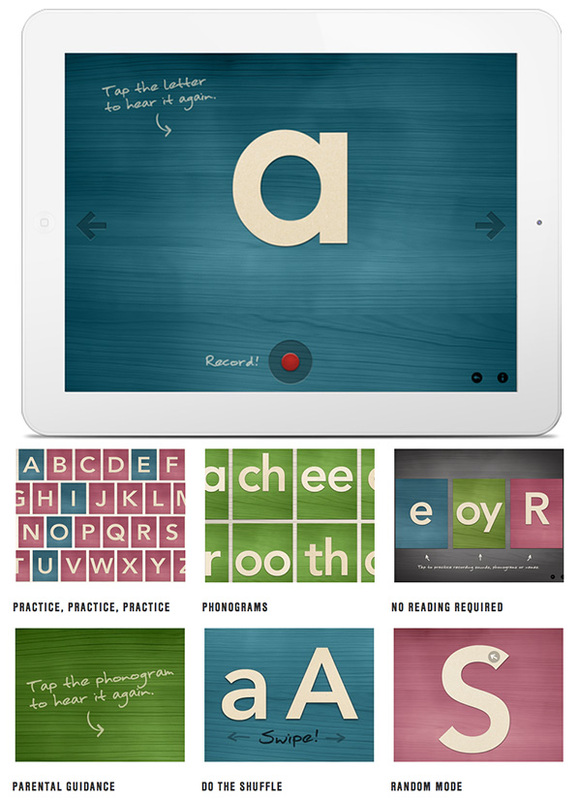 Especially with Montessorium, they’ve translated much of the Montessori style of learning to ipads and board books with stunning illustrations. 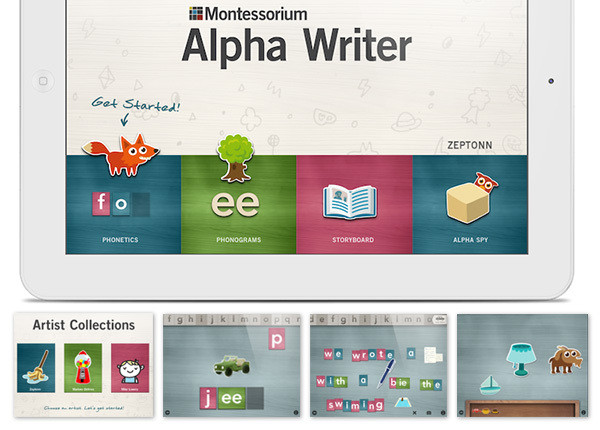 For Alpha Writer, you can even switch between illustrators - Zeptonn, Mike Lowery,and Marloes de Vries! 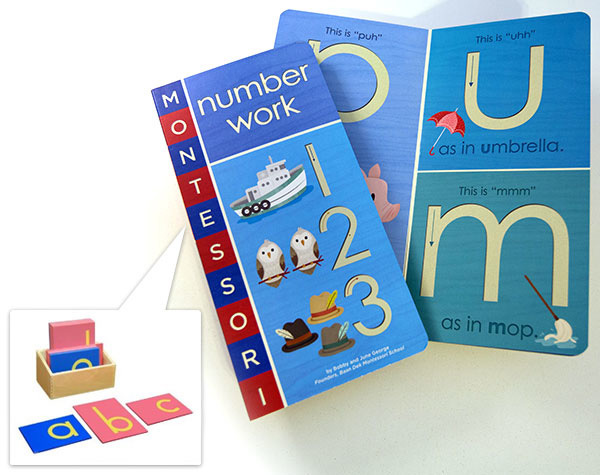 Taking the sand paper letters and numbers to board books only seems natural - and the added texture in the board books is fantastic! 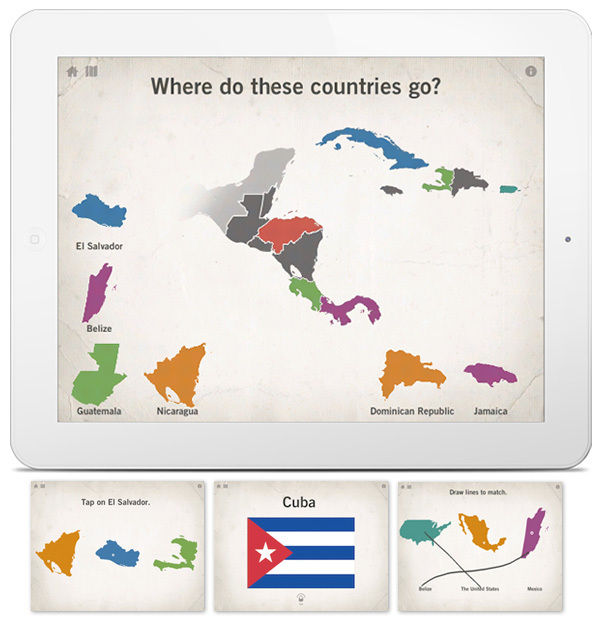 The iPad apps, so beautiful, educational, and fun! TO WIN: Either leave a comment here sharing what inspired you as a kid by midnight 12/22 PST for a chance to win. Winner will be contacted via email. OR - tweeting and following @NOTCOT and @Montessorium and/or instagramming and following @NOTlabs and @Montessorium sharing what inspired you as a kid by midnight 12/22 PST for a chance to win. We’ll direct message/comment to the winners. See more details of the goodies on the next page! TO WIN: Either leave a comment here sharing what inspired you as a kid or by by midnight 12/22 PST for a chance to win. Winner will be contacted via email. OR - tweeting and following @NOTCOT and @Montessorium and/or instagramming and following @NOTlabs and @Montessorium sharing what inspired you as a kid or by by midnight 12/22 PST for a chance to win. We’ll direct message/comment to the winners. i had an amazing teacher who dressed up in silly costumes (vonda viper the verb lady was my favorite!) to teach us about topics that would be less than interesting. she took us on extra-curricular field trips to explore the city’s museums and architecture - on her own time! love. her. I was inspired by trees as a kid. Trees and the sky! As a kid, it would definitely be videogames. Although at the time I had no idea, and I don’t have much time to play games now, I can constantly see videogames show up in my design and art work. I was inspired by nature. I was always outside exploring, riding horse, building forts, slidding down the hill, what ever I could and I learned as I went along. Great teachers growing up, and reading anything that I could get my hands on. Each summer my father made me write to different Embassies. This introduction to the diverse cultures of our wonderful world inspired me to want to learn more. my father. He worked so hard all his life but was still full of fun and always had a twinkle in his eye. My uncle inspired me - he was a veterinarian but once he retired he went back to school and learned photography, archeology, among many other things. I was inspired by my books, i read all the time, i was greedy for knowledge and consumed books 3 & 4 at a time rushing to get to the next one and rereading my cherished favorites. I agree with John. Lego!! The great outdoors inspired me. I spent 90% of my time in/on/or fighting plants of some sort. Written word. Good books, poetry, even greeting cards. The stars. they were the source of endless conversations and discussions. Great teachers in school inspired me. I loved building toys like Legos - anything that could be taken apart and put back together was what inspired me. I loved books of all kinds as a kid and that was my biggest inspiration, along with my parents’ encouragement. I was always inspired by Rube Goldberg. Still am. A pencil and a blank sheet of notebook paper. I was inspired by my 6th grade teacher, Ms. P, who had a tarantula in the class named ChorusLine, who made us study the world’s religions for a big debate, who showed me how to piece together a movie with stills and live shots and who put me on the path to be the teacher I am today. LEGO and DUPLO began to inspire me at a young age and continue to do so today. I play with these toys that last from generation to generation. It pleases me to share my (growing) collection now with my daughter. I was always inspired by how my parents always were true to us and true to themselves and how they taught me to treat others. I was inspired my by mother who was a primary grade teacher and I would spend time before and after school in her classrooms pretending to be a teacher, using the chalkboard teaching imaginary students and making work and art projects for my (imaginary)students to do. I was and still am inspired on how things work. How one thing leads to another. My grade 4 teacher with her spelling bees; I have always been able to spell very well. I was quite the bookworm. I was most inspired by the creativity and ingenuity of Roald Dahl’s books. Our kids (2 and 3 years old) are Montessori kids and we read to them all the time, let them cook with us and help with the house work. Was always around art supplies…colored paper, stickers, paints, and more. Really thankful for that as an adult, still love crafting! When I was a kid I loved history. Old buildings, ships, clothes, stories, anything with a past was fascinating. sounds cheesy but my mom. She was always drawing and painting when I was little. I loved colourful crayons and papers in kindergarten. My Dad inspired me as a kid- he is so smart in many ways and I love how he never, ever talked to us like we were kids! We had many conversations where I would always learn something new-he had a great volcabulary and that has rubbed off on me! My teacher Miss Loewen inspired me to always stand up to bullies and be proud of who I am. What inspired me as a kid was the crazy colorful books and TV shows made for kids. I still have that love of color. Captivating a child is a challenge, inspiring a child is a challenge - traveling down this road with a child is an amazing adventure. I was inspired by the books i’d read! What imspired me as a kids was games. I had trouble reading in grade school and my parents and a tutor at school all spent extra time with me playing games. I had to read each card and I still love games to this day. What inspired me the most as a child was reading. No matter what bad things were happening or what was going on around me I could curl up with a good book and travel somewhere else. My Grandmother was my biggest inspiration, she was the most loving person I know. The stories my teacher in 4th grade told us about a little boy experiencing lots of adventures. awesome way to teach children and open the world of possibilites to them at a young age. As a child, my parents inspired me to do what I loved and find my passions. My grandfather inspired me to do well and be good to people. MacGyver inspired me as a kid. No need for violence, just carry duct-tape, paper clips & a swiss army knife. Reading with my grandma and my sister made me love reading and helped fill my imagination. I was inspired by my mother’s creativity and thriftiness and by my love of books to begin learning how to do and make as many different kinds of things as I could. As an adult I always ask myself, “Can I make do or make it myself?”, before I buy anything. My kiddos are inspired by the act of learning itself. They amaze me. They would go nuts over this bundle. Books. I was constantly reading. As a child, and even today, I am inspired by objects I find in nature. What inspired me as a kid were the concepts of “right”, “noble”, and “duty”. Sounds corny, but that’s not so surprising when looking at my career. Reading inspired me. I learned to read at a very early age and had an insatiable appetite for books from that point forward. Educational computer games helped me learn math. origami - all the incredible thins you can do with just a piece of paper. What inspired me as a kid was star gazing. I always thought to myself that if I could think it and work hard enough at it, I could be able to achieve anything. Star Wars inspired hours upon hours of play. Most memorable to me was the time I spent on my bike pretending to be Leia on a Speeder Bike flying over Endor’s surface at break-neck speed. My dad brought us to the Art Gallery of Ontario when we were kids and I fell in love with Henry Moore and Picasso. It made me realize that people can make beautiful, wonderful things that can stay with you forever. my montessori education inspired within me a love of learning, which continues today (i’m a grad student)! Playing with Legos and Erector Sets with my Grandfather was always an inspiring time. What inspired me as a child was gummy worms; my montessori school had a game where we fished for gummies with paperclips through them using magnets on string… I am not ashamed to admit there were a few of those ones with paperclips that never made it to a teacher to be traded in (in retrospect though, eww). It’s a bird. It’s a plane. It’s Superman! Superman inspired me as a child with the ability to leap tall buildings in a single bound and pick up trains and always save the damsel in distress. Puzzles! Loved them, me and my brother would have competitions on who could finish one first! Continually activated our minds. My dad used to bring home junk/broken electronics with all kinds of crazy cool knobs and switches and dials. It was a blast and got me interested in engineering and computers; all from a bunch of tossed out junk! All kinds of fiction books inspired me when I was younger — I read voraciously. My LGB train set. It was always my job to set it up (this time of year) and run it. I also learned the value of maintenance as the set corroded in storage over time. I was inspired by the other kids around me who had normal lives. I knew I could have one too and that was what I provided for my own kids when they were born. My father, who died a year ago, was a sailor. He was the chief mate of a ship moving corn and wheat from the USA. As a young girl, he used to take me with him to his trips on summer vacations. I used to stay with him in his watches on the bridge. I would sit on the big table, with a huge map of the world spread over it. he would draw the rout of the ship, and tell me all about the straits and gulfs, islands and currents. he taught me the names of all the constellations, and when he told me that the stars in the southerns hemisphere are different - I didn’t believe him. He left a desire to know the world in me, a desire i still pursue, in traveling, and in my studies ( I am a masters student in Geography now). I miss him. Non-Fiction books mainly but also the PC game the magic school bus! Classic! Movies. The idea that we can suspend disbelief to watch paid people wear costumes, reciting scripts on a set, that somehow makes us feel more about life than reality does. Creative stories my dad would tell us when we were growing up to keep up entertained. And I would love to get both of their books. That would be awesome for my toddlers. Reading inspired me; I devoured books from morning until night. I developed a love for drawing by reading Japanese Manga. well, so…it was saturday morning cartoons like rocko’s modern life and ren & stimpy that made me want to draw, so i guess that’d be the inspiration? I started drawing when I was young and never really stopped, now i’m a starving (but happy) artist. I was inspired by views from a higher altitude. Legos inspired me and cannot wait for my boy to be old enough for me to get to play with them again. I was inspired by mccalls storytime treasury series from 1969. awesome illustrations and format. blocks…. I played with them for hours on end. I was also inspired by kaleidoscopes. When I was really little, I was inspired by traffic signals (like the actual red/yellow/green lights) - in fact, I told my mom I wanted to “be one” when I grew up. Funny that in my current job, running a small startup, I am a lot like a traffic signal, helping people decide when to proceed full speed, slow down, speed up to get through something and succeed and (of course) stop. Mad Magazine especially Spy vs Spy. We were a tad too young for these reading materials but my awesome parents guided us through and through. In those days there of less media scare and parental control exploring local neighborhoods was a fact of life for kids. Since most city-scapes today are either flat suburbia maze or a city jungle - there ain’t many places a kid can philosophize. Thus anything which would look like an out of place in our city - would be the escape spot. For me there were two places: railroad tracks behind a shopping mall - where the road seemed to be endless and clear, hugging the horizon, promising the escape to whatever-i-want-i-can-do land; and any sharp slopes (usually leading to a dumpster ditch), not just because there was a treasure load of “gadgets” a boy can claim, but even the run or slide (depending on season) down the hill was the most exhilarating filing in it’s simplicity. In the end it is not a person or phrase that inspires you to go in any particular direction - but it is a place and time where you trust yourself to make that choice. My grandfather was the one who influenced me the most. He was an artist with his own studio. He painted in watercolours and oils, he made Wood and metal art. I especially remember a musical statue that stood in the courtyard of a bar he opened in Spain, where he retired. And he read to us. Tolkien, CS Lewis and Conan Doyle. He taught us to go for your adventure! I was inspired by my parents and the environments that I came in contact with… I remember my dad saying you can learn just by looking at things around you… Teaching observation to a child… My dad was a brilliant man!! King Quest - The Princeless Bride. I had so much fun with computer games when I was younger. Both the kings quest adventure games and the fun educational games live Treasure Cove and Math Blasters! Tons of books and cartoons. I was inspired by Madeline L’Engle books. Carl Sagan inspired me beyond explanation! NASA always inspired me as a kid.. I used to want to be an astronaut.. The animated Hobbit movie for one, also my art teachers. Spy movies. I had notebooks full of nifty inventions and escape plans for areas all over my neighborhood. I love that stuff. 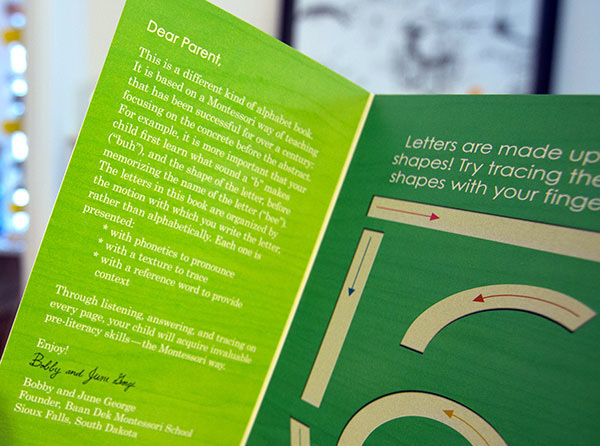 My sister & I grew up in the Montessori system as well - these are stunning! I guess I’ll have to start accepting that technology is a daily part of children’s lives now :-) I was inspired by my grandpa - who passed on to me his love of exploration and investigation of the world around us. The Day of the Tentacle and other point and click adventure games.